As sustainable professionals know our turf grass lawns must continue to evolve away from excessive carbon inputs, such as frequent fertilization, pesticide use and considerable watering and mowing. The new varieties of turf grass that we've blended and field tested for our low impact turf products mitigates these issues to a near zero carbon footprint while enhancing all aspects of your LEED project. As a LEED AP you know that only projects may be LEED certified, however the right turf can help you achieve valuable LEED credits. The size of our sod pieces are 2 ft by 4.5 ft, and weight about 45 lbs. per piece on average. SS2.2A: Basic landscaping design- "Any turf must be drought tolerant". all of our varieties excel in high heat tolerance and drought resistance. SS2.3: Limit conventional turf- The USGBC credit interpretation for conventional turf refers to "considerable watering, mowing and/or fertilizers". The intent of this credit is that any turfgrass that requires routine watering, mowing and/or fertilizing should be considered conventional turf for the purpose of this credit. Our Low Impact Turf ONCE ESTABLISHED will not need to be watered other than what mother nature provides, will not need to be fertilized and mowing can be as little as once a month, although every other week would keep the lawn more uniform in appearance. WE Credit 1: Water efficient landscaping- The intent of the credit is to limit or eliminate the use of potable water or other natural surface or subsurface water resources available on or near the project site for landscape irrigation. Our Low Impact Turf ONCE ESTABLISHED will not need to be watered other than the rainfall mother nature provides. WE Credit: Outdoor water use- The intent is to reduce outdoor water consumption through efficient landscaping practices. Our Low Impact Turf ONCE ESTABLISHED requires no input of additional water resources. 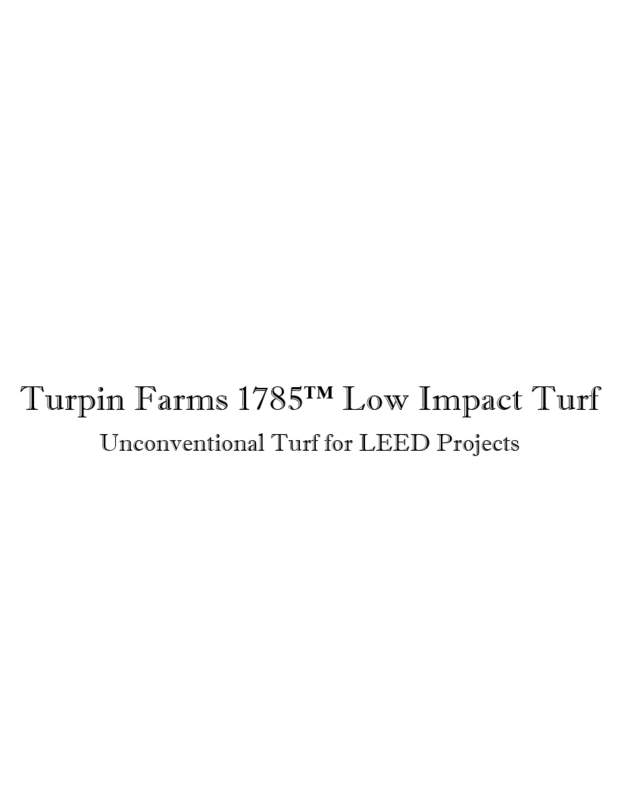 Our Low Impact Turf varieties were hand picked by our on staff LEED BD+C who also serves as chair of the USGBC Cincinnati Regional Chapter Sustainable Sites Member Circle. Please contact us for any more information or questions you may have.